Today I have something new to share with you all. 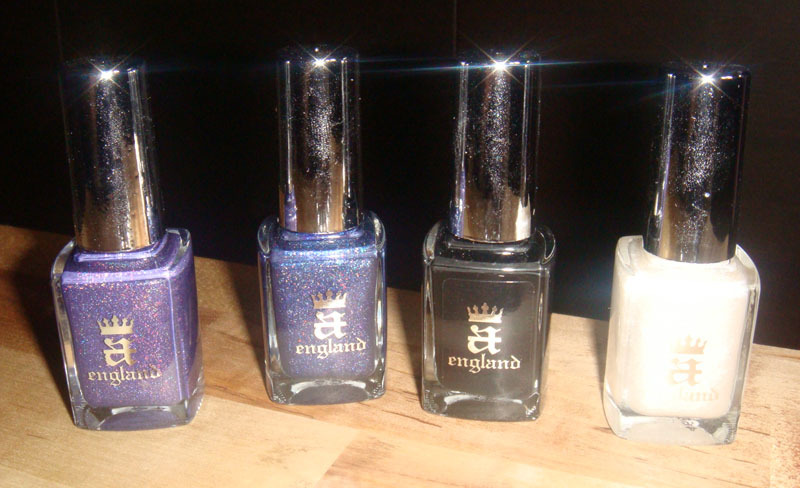 A new nail polish brand named a-england. A few days ago I got an email informing me of this new brand so of course I had to check it out immediately. Taking a look at their website I was impressed by their collection, called the Mythicals. I loved everything about it, from the colour selection to the names, so since I had some money from Christmas, I decided to place an order and check them out. I had a really hard time deciding on the colours but in the end I decided to go for the two holographic colours (you must know by now how much I love holo polishes) Lady of the Lake and Tristam and also for Camelot a luscious black colour and Morgan Le Fay, a sheer glittery silver which looked perfect for layering. A week after placing my order, my new polishes arrived neatly packaged. 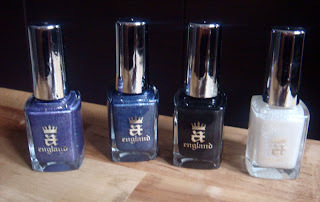 I have to say that even though the pricing is a bit steep at £9.50 I am very impressed by the quality of these nail polishes. So here are some swatches for you to judge on your own. 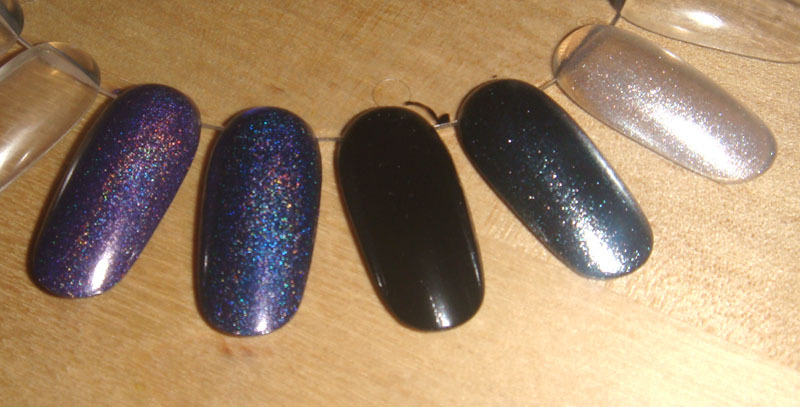 From left to right we have Lady of the Lake(purple holo), Tristam (dark blue holo), Camelot (black creme), one coat of Morgan Le Fay layered over 2 coats of Camelot and Morgan Le Fay (glittery silver). All swatches except the layered one are two coats. 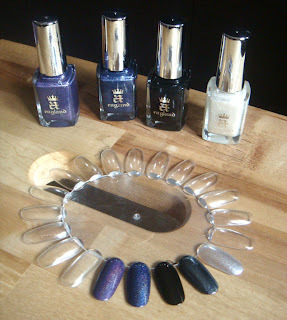 Here are the polishes on my nails too, to give you a better idea. 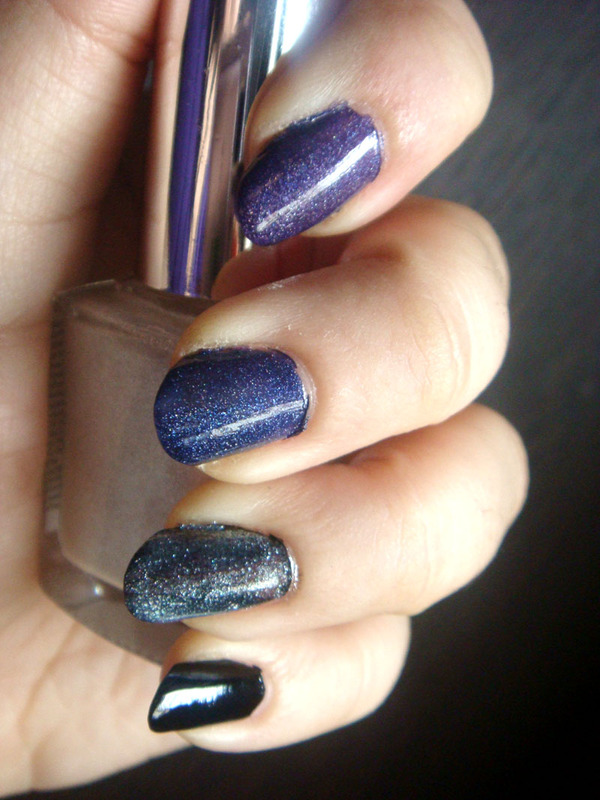 The swatches on my hands are one coat each without base or top coat except for the layering. 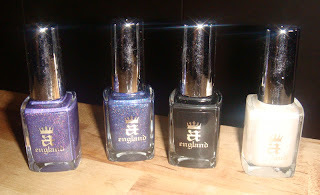 From top to bottom we have Lady of the Lake, Tristam, one coat of Morgan Le Fay over a coat of Camelot and Camelot. As you can see all the polishes except Morgan Le Fay are quite opaque with one coat. 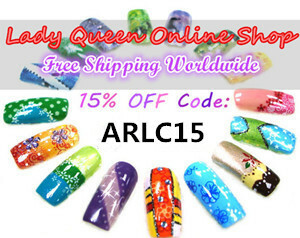 The formula was also very easy to work with and the polishes dried quite fast as well. All in all I would recommend you give a-england a try. I will certainly be looking forward to more from them. Kai o Lancelot prepei na ta ftia3ei me th Morgana. I also had an email on this brand and I *tried* for days to place an order but it wasn't worked out for me in the states to order. By the time it was worked out, I had moved on in my head. Great swatches and review - thank you! The names alone are enough to make me want to buy them! I'm planning to buy a few from this brand since my birthday is coming up. Lady of the Lake is simply gorgeous. I want this brand! I love the purple holo!! Wahhhh the holos look so pretty!! 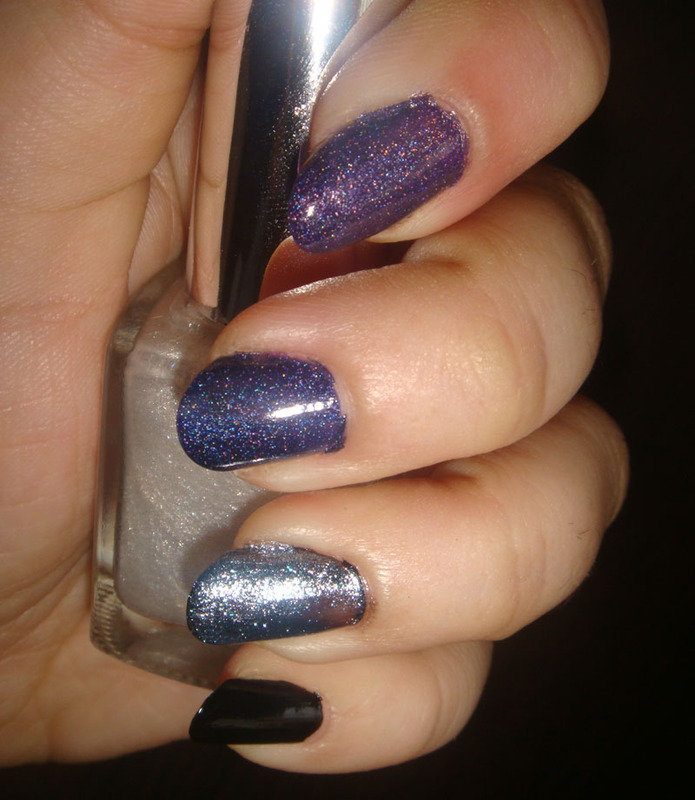 It is always exciting to discover a new brand that does holos =D Lady of the Lake and Tristam are definitely going on the wishlist. I love the names for the polishes from this range. Thanks for letting us know about this new brand and for the swatches!! love the blue holo !!! Love the light holographic effect of the purple and blue one!!! These are all so pretty! I love holographic-type polishes! I hope you check out my blog, i have a giveaway and want everyone to enter!